While the previous Egyptian government has increased the average electricity tariff from an estimated 2.2 US Cents per kWh in 2004 to 3.5 US Cents per kWh in 2010 (AfDB, 2010) , the Egyptian population has until now been able to enjoy highly subsidised energy prices, which have not encouraged energy saving (UNDP Environmental Finance Services, n.d.). 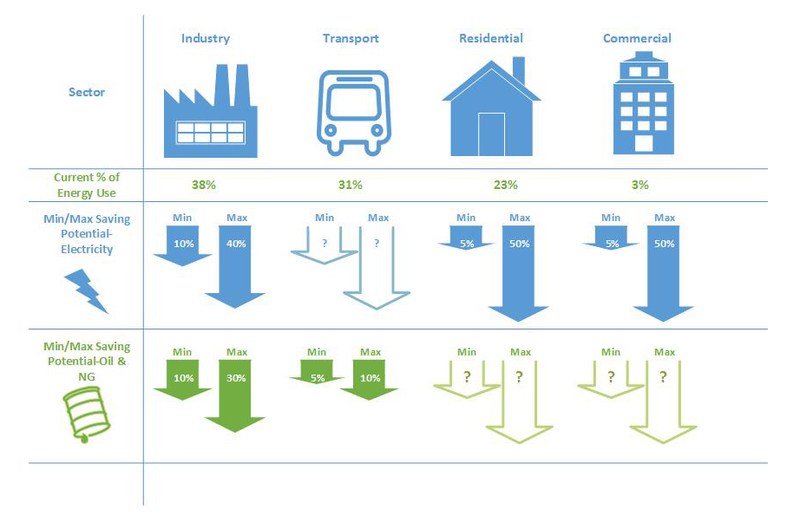 Such engagement of the public on the issue of energy use and encouraging behaviour change are emerging areas of research that have important implications for policy and could make a significant contribution to reducing energy use and resultant greenhouse gas (GHG) emissions (POST, 2012). During one of the last rounds of blackouts, the Government came under fire for solely concentrating on the promotion of the behavioural change aspect. Despite the fact that the per capita use of energy in the country was already low compared to the regional average, the previous Governmental approaches have included exhorting people to save electricity by, for example, wearing cotton clothes and gathering in one air-conditioned room of the house. Yet, while the evidence base for quantifying the impact of energy behaviour change is limited, a recent study in the UK found that conservation by lifestyle, awareness, low-cost actions (such as switching off appliance instead of leaving them on stand-by) had the potential to save up 57% of the energy saving potential of about 220 Mtoe compared to current use (Laitner, 2009). In applying these findings to Egypt, a range of interventions can be used to generate the behaviour changes that are needed, depending of course, on the existing behaviours that policy makers are attempting to change. In addition, and in light of the previous Government’s failure to properly communicate its approach, it remains important to consider how each potential intervention is communicated to its target audience. It is also important to consider group dynamics, especially that research in this field suggests that people are heavily influenced by others around them and tend to adopt their opinions, judgements and behaviour (DECC, 2011). In order to cope with future demand, a systematic expansion and reinforcement of the electricity infrastructure and generation facilities is crucial and can be achieved through increased Governmental commitment to infrastructure investment (AfDB, 2010). It is estimated that to meet the increased demand, an average annual expansion in generation, transmission and distribution capacity of 2000-3000 MW is required – approximately 10% of the installed capacity (Osman, 2008). Although average transmission losses in the National Unified Power System (NUPS) declined from 6.56% in 1998/1999 to 3.8% in 2007/2008, additional infrastructure upgrade work is also required to improve the efficiency of the transmission and distribution networks and to reduce losses within them (Bedrous, n.d.). A report by an international investment bank , EFG – Hermes, has highlighted that Egypt needs a further $45bn of investment in various sectors including energy generation and other utilities over the next five years. At least $15bn of this investment is likely to come through Public-Private Partnerships (PPPs), which involve private firms in the funding, construction, maintenance and management of new or overhauled infrastructure. However it should be noted that while building enough power plants to satisfy every possible supply and demand scenario is one possible solution to meeting growing energy demand, the economic cost and environmental impact (e.g. resultant emissions) of adopting this approach would be tremendous. 1. The ability to limit demand (Peak Demand Reduction) by shedding loads when pre‐determined peak demand threshold is reached. 2. The ability to shed demand (Load Shedding or Shaving) by temporarily reducing or curtailing peak electric demand. This would be used in the case of an unforeseen event that effects the grid. 3. The ability to shift demand, by changing the time in which electricity is used. This strategy would be especially effective if variable renewable resources are integrated in the energy mix. A recent report found that , at a global scale, the residential sector represents the most untapped potential for DSM. When applied in a residential context, DSM strategies aim to encourage residential consumers to use less energy during peak hours, or to shift their energy use to off-peak hours such as night time and weekends. This can be achieved through the use of policies such as dynamic pricing and tariffs, price‐responsive demand bidding, contractually obligated and voluntary curtailment, and direct load control or equipment cycling. However, the main challenges to the implementation of DSM strategies is establishing an infrastructure that allows access to consumer usage information, and the privacy concerns that result from sharing such information. 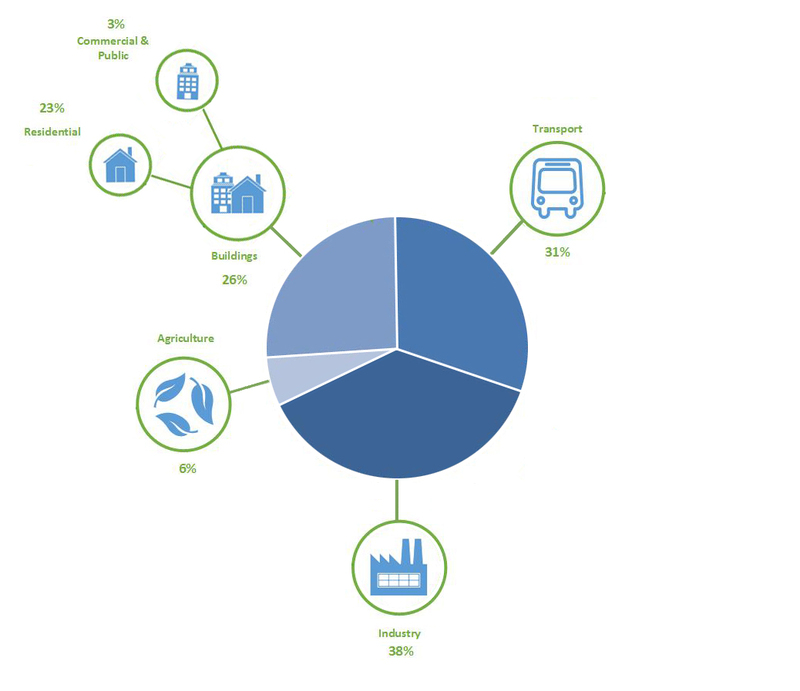 According to CAPMAS, the buildings sector in Egypt is responsible for 26% of the total overall energy consumption. However, the sector accounts for 60% of the total electricity consumption and around 70% of resultant CO2 emissions (Michel and Elsayed, 2006). Due to Egypt’s growing population, its high rate of rural electrification, its increasing use of electrical appliances, and its urban “heat island effect”, the residential sector has become the main consumer of electricity in the country. Statistics show that the electricity consumption of building appliances in residential, public, and government buildings accounts for approximately 50% of total electricity consumption. The most effective approach to improving energy efficiency in the building sector is reducing buildings’ energy demand through the improvement of fabric efficiency (e.g. using insulation) which can achieve a 40% reduction, and the installation of efficient equipment, appliances and lighting, which can achieve 30% and 10% reduction respectively (McKinsey, 2007). An economic analysis of energy efficient strategies in buildings suggests that the introduction of efficient lighting was both easy to roll out, economically attractive, and had a short payback period (i.e. are usually profitable for the end user). Energy efficient appliances had a much longer payback period compared to other countries due to the highly subsidised electricity tariffs. Thermal retrofitting of existing buildings and the construction of new efficient buildings were unprofitable for the end user and are unlikely to develop on the basis of spontaneous market mechanisms due to the high initial investment cost of energy efficiency measures, compared to the financial capacity of the consumer (Missaoui and Mourtada, 2010). To encourage the uptake of these measures it is important that a wide scale national program is developed and implemented. While some efforts have been made to promote and increase the energy efficiency of buildings through regional projects, programs and initiatives, this has been hampered by limited coordination of efforts and accumulation of gained experience (Beshara, 2010). In addition such factors as the lack of adequate enforcement of building codes and appliance energy labelling program requirements hinder successful implementation. Securing energy resources to meet the national demand both on the short and long terms, are considered vital elements for sustainable development (Georgy and Soliman, 2007). Securing such energy resources can be achieved through the diversification of generation capacity and the creation of a well-balanced energy system comprising various power generation technologies with suitable capacity. This enables the advantages of each to be maximised, allows prices to remain reasonably stable, and ensures the sustainability of supply (WCA, 2012). While Egypt depends to a great extent on oil and natural gas to meet the increasing demand on primary energy, renewable energy represents an important option for changing its energy mix. Renewable energy (mainly hydropower) currently accounts for a fraction (approximately 10%) of Egypt’s electricity generation. Under existing plans, Egypt hopes to produce up to 20 % of its electricity from renewable energy by 2020 while also developing a nuclear power program (EIA, 2012). However, since the capacity for additional hydropower is limited due to the development of all major sites, it is important to diversify generation through the increased incorporation of other renewable resources such as wind and solar which have been identified as having the most significant potential at national scale (AfDB,2010). 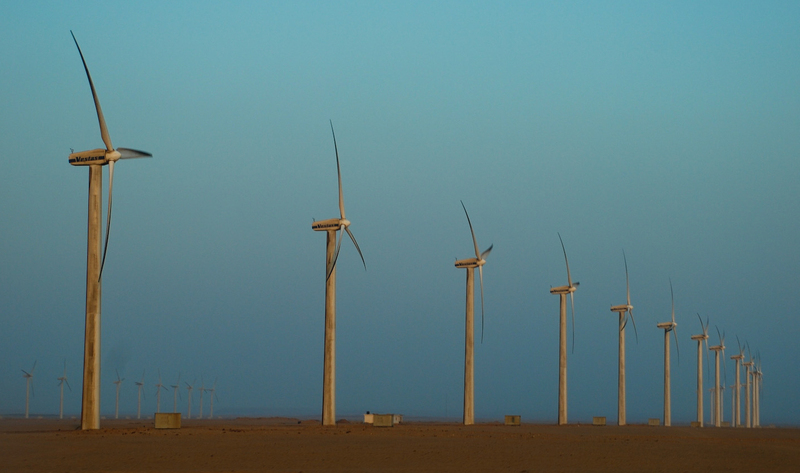 In 2006-2007 the installed wind power in Egypt represented a mere 1.1 % of the total installed capacity and generated only 0.3 % of total electrical energy. However future plans supported by such programs as the World Bank Clean Technology Fund aim to increase this to approximately 12% by 2020 through increased installations in key regions such as the Suez Gulf, Beni Suef ,Menia. and El-Kharga Oasis. Solar energy (both PV and Solar Thermal) is also abundant, and while more costly than wind energy, Egypt has plans to increase its share in the energy mix to 2% by 2020 (Beshara, 2010). Based on the outline of strategies above, it is obvious that Egypt has the potential to manage its energy demand, as well as control and recover costs, more effectively than it currently does. But these efforts have to contend with the primary energy challenge in Egypt, namely rapidly growing demand. Between 2005 and 2007, peak electricity demand in Egypt was increasing at a rate of 7-10%. 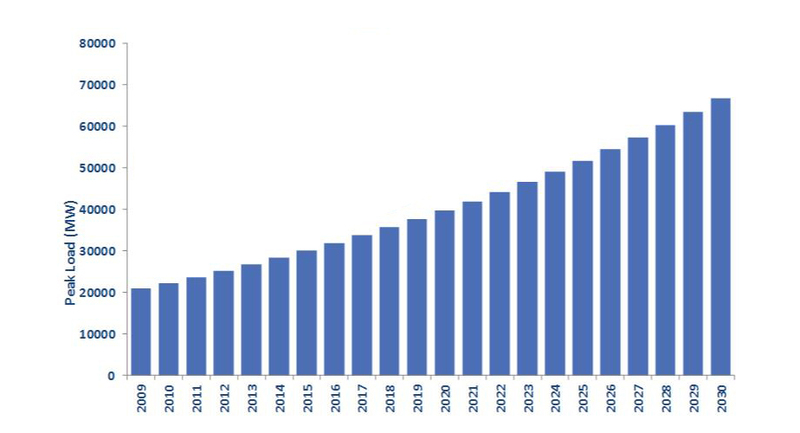 If this trend persists, peak demand is expected to grow by more than 10 % per year and the load is expected to reach 39.7 GW by 2020 and 66.8 GW by 2030. 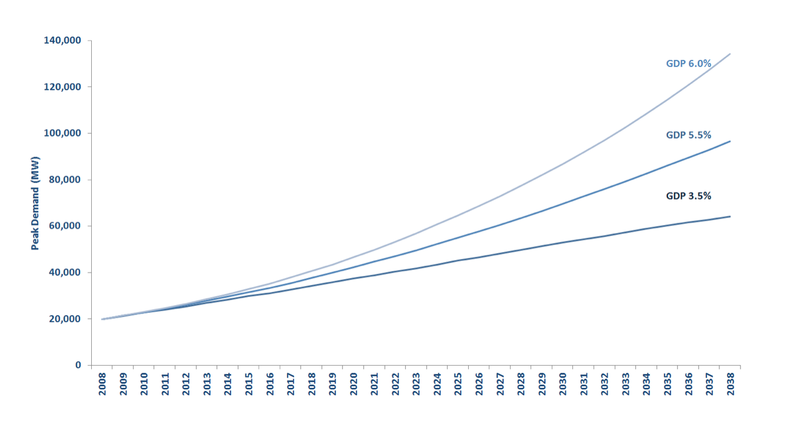 Growth in energy use in Egypt is dependent on economic growth. Energy consumption has been growing at the same ratio as the GDP and with stable level of economic energy intensity of 0.53 kgoe/USD1,000 GDP, four times as high as in Germany and almost double that of neighbouring countries (ADB, 2010). Yet the current low consumption per household and the desire for better comfort levels are reflected in a strong upward trend in consumption (JCEE, 2008). Demand forecast scenarios for the period between 2008-2038 illustrate the relationship between peak demand growth and growth in GDP. Under GDP growth rates of 3.5% (low case), 5.5% (base case), and 6% (high case) the peak load is expected to increase from approximately 18.8 GW in 2008 to around 65 GW, 96.5 GW, and 135 GW in 2038 respectively (SNC Lavalin International Inc. and Parsons Brinckerhoff, 2011). An energy strategy paper issued in 2007 by the now-defunct ruling NDP party, looked at possible pathways to fulfil Egypt’s energy needs over the following 15 years. The projections highlighted that the supply and demand levels recorded at the time implied that by 2022, 135 Mtoe needed to meet annual consumption requirements, of which 50 Mtoe will be unmet. These projections assumed that export commitments and fuel available from such sources as natural gas and hydropower will remain constant, while total energy consumption and energy available from wind energy and nuclear power will continue to grow. 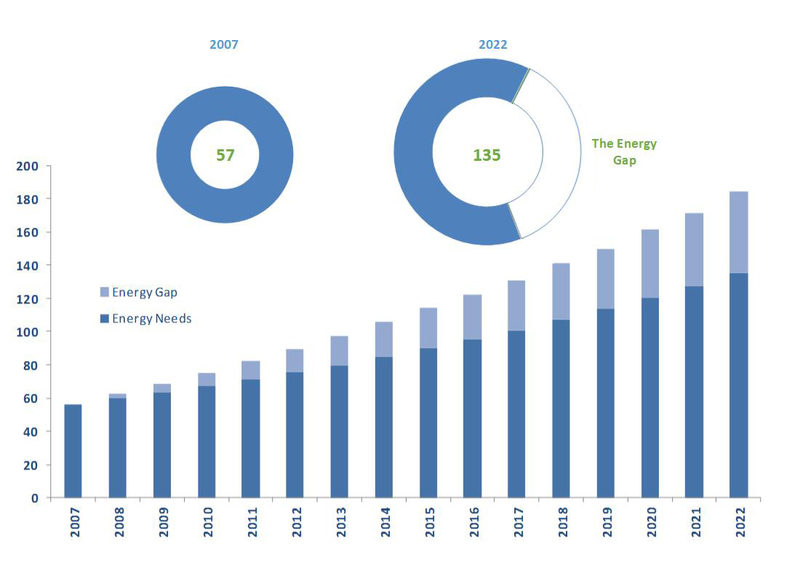 As significant new oil and gas discoveries are limited and predicted energy demand is expected to exceed the national energy supply potential by 2015, the reduction of national energy intensity has moved further into political focus (ADB, 2010). Studies have estimated that the total economic potential of energy savings from various energy saving strategies and infrastructure upgrades could halve the annual energy consumption. The above discussion has highlighted that to address the current and future energy challenges in Egypt exemplified by the recent spate of blackouts, a holistic approach to energy demand reduction that integrates a variety of technical and policy options across the various socio-economic sectors should be adopted. While a number of solution pathways can be identified, a critical knowledge gap regarding understanding how energy is used in the various socio-economic sectors in Egypt still exists. Future work in this area represents an important field for the implementation of evidence-based research to inform the decision-making and policy formulation process required to ensure that Egypt is able to meet the challenges ahead.